Iris 'Abbondanza' - so far it's the only bearded iris to flower reliably in this garden, but what a beauty it is! 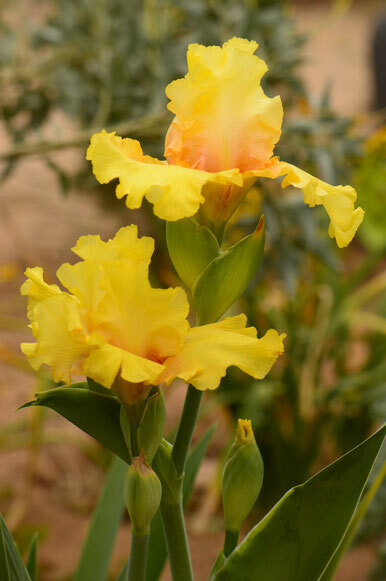 It opens brilliant yellow blooms with tangerine shading at the center, brightening into orange beards. I love love these! Some yellow iris appeared in my garden this year (HOW did they get there??) and are looking stunning with the blue/purple. But I love the centers of these! Libby - Volunteer irises sound wonderful! ;-) I noticed the purples on your blog photo; they look lovely. 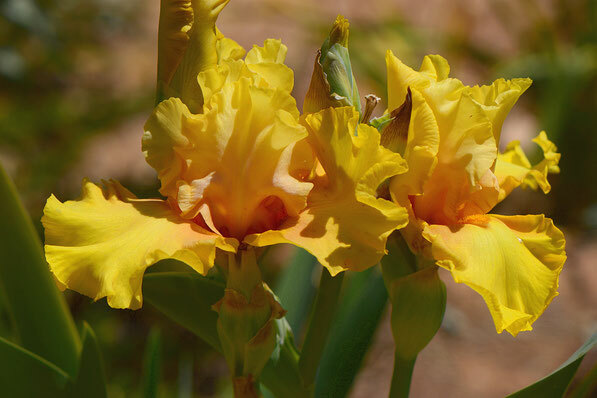 There are certainly a lot of yellow irises available; it really was the centers that made me go with this variety. Cathy - Oh I wish my blue ones would bloom! They are all starting so slowly, but these yellows have been free-blooming from the first - not sure what makes the difference... Will look forward to seeing yours! It's a gorgeous Iris, Amy! I've had a terrible time with these bulbs for the past several years, which is too bad as a love them. Thank you, Kris! I knew you had had mixed results with iris, and I tried to watch my late winter watering as you had mentioned some time ago, but the irises just aren't cooperating as much as I'd like... :/ They are known to grow satisfactorily in gardens here, though, so I'll try a little longer. P.S. So sorry for missing your comment all this time - not sure how it slipped past my attention so long! Many thanks, Annette! I didn't notice much scent, which surprises me a little as I've had some very fragrant iris varieties in the past! I think my taste for using bearded irises in the borders is a bit unusual ;-) as I even enjoy the foliage throughout the year. However, I do object to growing them if they won't flower...! Hopefully they will do better by next year. Hope you have a lovely springtime!